Recipes generally assume the home cook will follow its sequence of steps in one or two sessions. We do not. In breaking down a recipe into increments suitable to your available and convenient time, you can make a once-ambitious project doable for everyday. This is one way we teach to “Purple Kale” a recipe. We particularly like doing this with pie. Below is a breakdown of various possible prepping points for a savory pastry dough, Pate Brisee. What’s most impressive is not only how little time each individual step takes, but how far in advance you can begin–even as much as a season away. Also, you can make many pie shells in the same total time it takes to complete one. Lastly, with slabs of dough on hand, you are not only one step closer to pie, you’ll have options for other “quick” pastry dishes, too. Notes: The steps shown below may be done singly, over the course of days or months, or all at once, in an hour. How you do proceed is entirely up to you. Pouring flour into storage bag. Adding sugar/salt to each prepped package. The flour mixture ready to store. 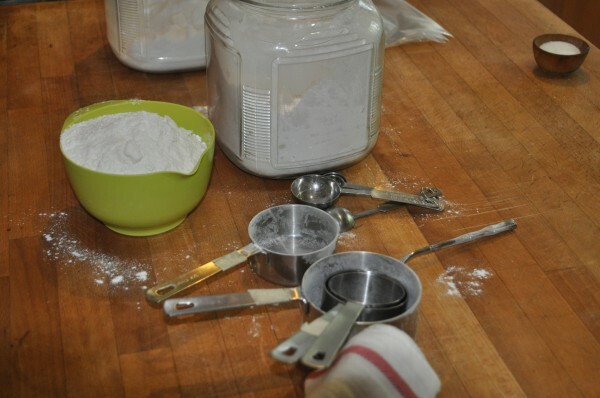 Storing butter and dry ingredients together. Butter/flour bag into food processor. Dough wrapped and labeled for resting/storage. Ready for filling/storing for later use.